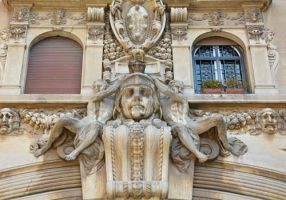 Take a delightful break from the dense history and architecture of the central part of Rome among the whimsical and strange architecture of the Coppedè district. 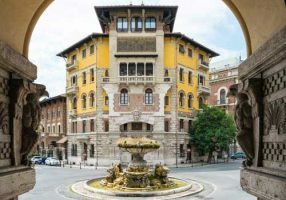 It is just east of the Borghese Gardens in an upscale neighborhood, filled with embassies. From the Spanish Steps it is a 15 minute taxi ride, 30 minutes by bus or a 40 minute walk. 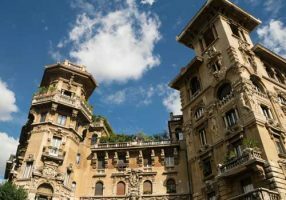 This amazing district was designed by Gino Coppedè (1866-1927) an architect and designer who joyously designed buildings throughout Italy with Art Nouveau style. In Rome the homes and structures evidence styles from medieval, baroque, greek and just plain fantasy! Start at the arch on Via Tagliamento and wander through to the whimsical Fountain of the Frogs. Then just spin around to see palaces and buildings from, seemingly, a movie set. Delightful. Palace of the Ambassadors is a medley of styles. Use your camera to focus on the amazing details. In Tuscany, the Bucine estate features a Coppedè castle in medieval style. 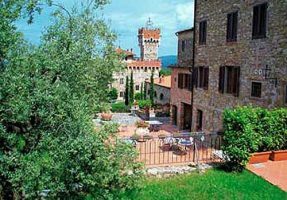 Guests at the agriturismo represented by Italy Perfect can take a cooking class in the castle.